(12 July 2016) – CESNET-Italy-Slovenia-Croatia has launched an invitation to participate in the TerraFest Eko march 2016, on 1-6 August, between Rijeka and Karlovac. 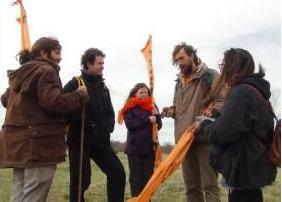 The march will be complemented with seed exchange, bioregionalism and permaculture workshops. Earth festivals exist in many cultures, ancient and modern, from mountains to the oceans. In rural and semi-rural communities, seeds are an integral part of many rituals, ceremonies and festivals that celebrate the cycle of birth, life and death. TerraFest is an opportunity to meet and celebrate that old spirit of sharing rooted in the territories of the bioregions between Italy, Slovenia and Croatia. Also this year the event dedicated to ecology, the fair share and exploration of the landscape in bioregions, continuing the path outlined in the previous edition. The walk will take place in Croatia. It starts in Rijeka, going from project to project, covering about 150 km on foot to Karlovac. Along the way, numerous associations and activist groups will meet, make presentations and workshops, exchange seeds, books and much more from their areas to improve relations.